Here are pictures from the June 2001 W7KK Multi-OP. 2 Meter Station at W7KK - DM18 - June 2001. 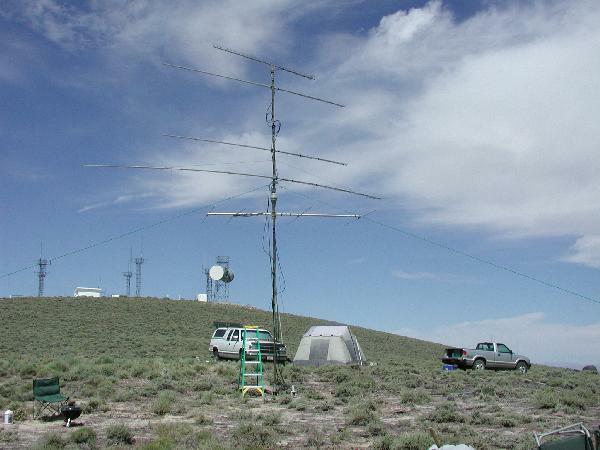 A pair of M2 18XXX yagis at 40/50' atop a 40" tower trailer. The station included a FT-847, Commander II KW amp, and 486 laptop running HSMS / logging software. 222 / 432 / 1296 Station at W7KK June 2001. 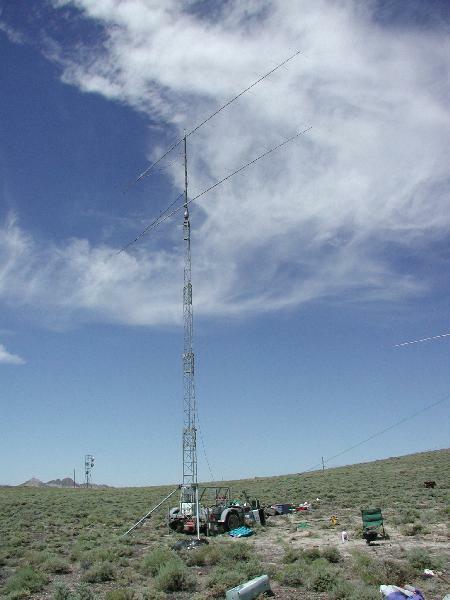 Single M2 9WL for 222, Pair 0f M2 9WL for 432, and single 45 element loop yagi for 1296. Undeneath the rotor is a 4 ele 6M yagi fixed due north. 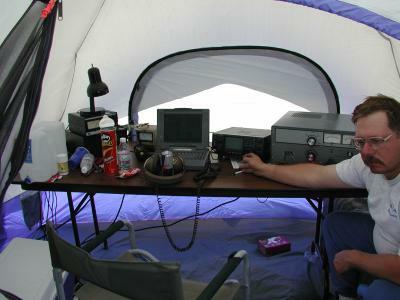 6M Station at W7KK - DM18 - June 2001. 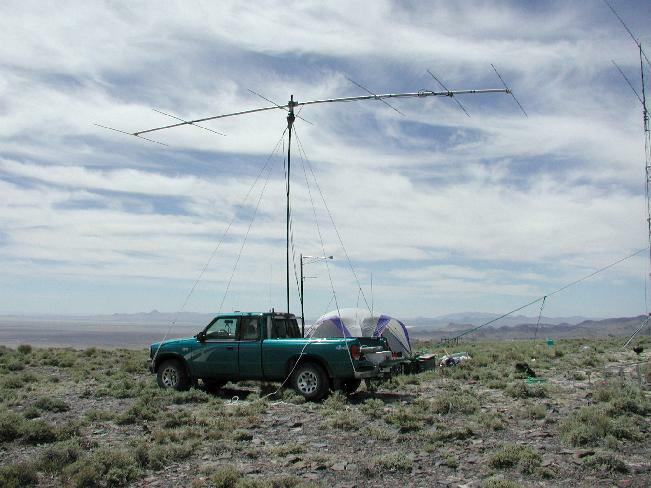 Homebrew 6 ele K7XC yagi with 30' boom on 30' tiltover mast mounted in the bed of my Rover vehicle. It is guyed with 1/2" rope to eye bolts installed on all 4 corners of the truck. Detailed photos and description of the truck bed mounted tilt over mast will appear here in the near future. Here we have a very tired 6M Operator, Tim - K7XC, still tuning for Q's Sunday afternoon with only 3 hours sleep. 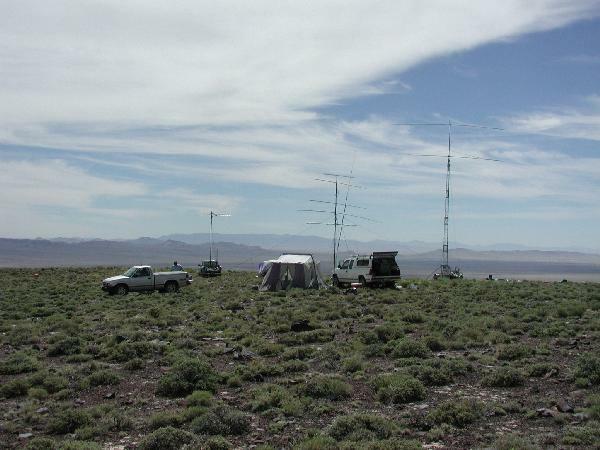 Station includes: A IC-746, Command Tecnologies 6M KW amplifier, Astron RS35a, Pentium 100 Laptop running VHFtest 5.01, Mirage MP2 wattmeter, Heatkit coax switch, and Hygain ham 4 rotor controller (Old Style) along with plenty of water and snacks. Here is Tim - NS9E or "T-2" as he is becoming known here. He was responsible for the UHF station. What he didnt know it that Murhpy was along for the trip and made his life hell trying to keep the station on the air. 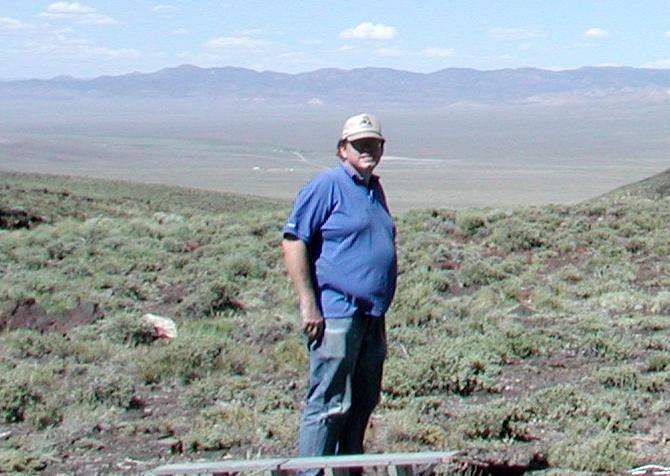 Looking Eastward, here is a overview of the complete site atop 6000' Booker Mountain near Tonopah NV in DM18. It was clear and hot when we arrived. By the time we left it had dropped 20 degrees and included gail forced winds.